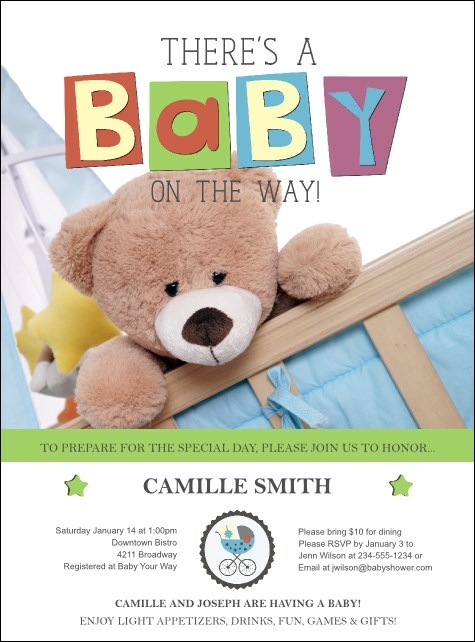 Make everyone aware of the abundant family when you use this Baby Shower Teddy Flyer. The soon-to-be bouncing baby will get quite a welcome when sweet shades of purple, blue, green, yellow and red mingle with a soft snugly teddy bear in his crib. Easily use 12 open lines to communicate every detail to prospective guests. Make event planning a breeze with CanadaTicketPrinting.ca.